RevGenetics has been the top independent researcher of TA-65 products outside of TA Sciences themselves. Recently we compiled the large list of TA-65 studies that shows that TA-65 and its active ingredient is the product with the most extensive number of positive laboratory studies available. Is your TA-65 Doctor qualified to do cellular laboratory research and add to these TA-65 studies? Dr. Valenzuela and I have decided to provide a list of studies below that pertain to TA-65 and it’s active ingredient. 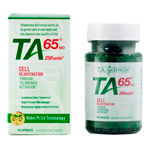 As president of RevGenetics, I provide this information to our customers and friends due to the overwhelming positive response of the product and best tested telomerase activator, called TA-65. (TA Sciences 2013, Unpublished).This study evaluated 125 healthy adult humans in a Double Blind Placebo Controlled (DBPC) study. Providing two capsules a day for 30 days. Safety Parameters: The study measured safety parameters including blood pressure, body temperature, blood glucose, liver function, kidney function, thyroid stimulating hormone, pH blood, pH saliva, and pH Urine. Efficacy Parameters: Homocysteine, C-reactive protein, T-cell (CD4 and CD8), nitrates, and oxidation reduction potential (blood, urine, saliva). The preliminary clinical analysis of safety and effectiveness of TA-65 shows that the product is safe and effective for short term use in humans. (Rejuvenation Res. 2011, 14(1):45-56) The study reports on the first year of taking TA-65 with a dietary supplement pack and doctor visits and tests. Low nanomolar levels of TA-65 moderatly activated telomerase in human keratinocytes, fibroblasts and immune cells in culture, while similar plasma levels of TA-65 were achieved in pilot human pharmocokinectic studies. In Vivo: The most striking in vivo effects where declines in senescent cytotoxic T-Cells. Although Mean telomere did not increase, there was a significant reduction in the percent of short telomeres. The study concluded that the protocol that used TA-65 lengthens critically short telomeres. Toxicity study showed no effects attributable to the TA-65 ingredient orally administered to animals. The no observed effect level of the ingredient was at a very high amount of 150 mg per kilogram of bodyweight. Normal humans would never reach anywhere close to that amount using the TA-65 protocol. Bacterial reverse mutation assay: Found no cytotoxicity and no mutagenic response was observed. In Vitro chromosomal aberration assay: No dose-response relationship was observed. The aberration rates for 2 of the groups fell within the range of historical control data. In Vivo erythrocyte micronucleus assay: Under the study conditions TA-65 was not clastogenic and/or aneugenic. The TA-65 ingredient did not induce structural and/or numerical chromosomal damage in immature erythrocytes of animals. A Xenographeted Mice Study (TA Sciences Unpublished): Using 5 mg per kilogram of bodyweight of the animals with attached human tumors. The study showed no treatment related effect on survival (mean or maximum) was observed. The summary TA-65 at a level of 25mg per kilogram of animal bodyweight for 4 months was well tolerated in aged mice with no effect on survival and no increase in malignant incidence. TA-65 applied topically on experimental created lesions in animals under anesthesia, showed significantly greater cell density. Are there other TA-65 Studies? While we know that there are other TA-65 studies, such as the PK study that shows TA-65 is 50x better, the mouse study by Maria Blasco and those done by Dr. Valenzuela. We wanted to provide a list of lesser known TA-65 studies that have been done to support the safety and effectiveness of TA-65. We hope that this list of studies will help clarify any questions about our recommended TA-65 products and why we fully recommend TA-65 as our best tested and only telomerase activator at RevGenetics. 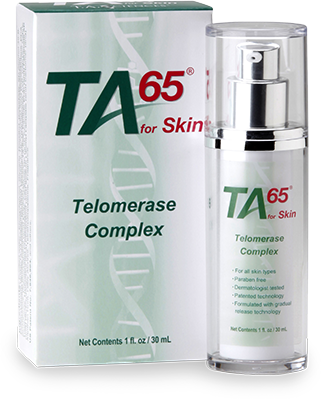 Introducing TA-65 For Skin: While you now take TA-65 in capsules, we now introduce TA-65 Telomerase Complex for skin application. Yes that is right, it contains the same active ingredient as encapsulated TA-65 but formulated specifically for your skin with gradual release technology. This product has been dermatologist tested, paraben free and for use on all skin types. If you would like to add another research paper to the list of TA-65 studies, please let us know.